It gives me immense pleasure to be here today for the third Convocation of Nagaland University, a premier centre of higher learning in the North Eastern Region. I am privileged to be in this University, whose foundation was laid in 1987 by our former Prime Minister, Late Shri Rajiv Gandhi. 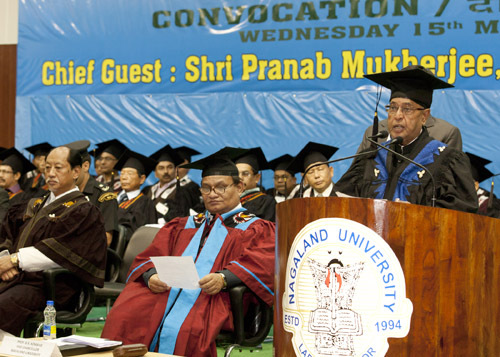 Ever since its establishment, Nagaland University has made great strides in various fields of teaching and research. By imparting quality education to students from this region, it has acted as a centre of empowerment of people. I am happy to note that this University has a Centre for Gandhian Studies and Research to impart Gandhian values to its students. This University’s Campus at Lumani is characterized by its picturesque beauty and lush environment providing congeniality for teaching and research. It is a result of the vision of leaders like Dr. S.C. Jamir and Shri I.K. Sema that this Central University in Nagaland was conceived. I am happy to confer today the Honorary Degrees on Dr. Jamir and Professor Mrinal Miri, another renowned personality, for their outstanding contribution to the advancement of education in the State. Nagaland is an important State of our country. It is a very good example of ‘Unity in Diversity’. It has made substantial progress in human development, with literacy and infant mortality rates better than the national average. Its indigenous art forms, culture and tradition are a matter of immense pride. Its rich natural resource and gifted and industrious people are an asset for the State and the country. Education is a powerful tool for social thinking and transformation. The recent increase in cases of brutal assault on women and children has shaken the collective conscience of our nation. These unfortunate incidents underscore the urgency for us to introspect at the erosion of values and to devise effective measures for the safety and security of our women and children. We must identify the causes of moral decline in our society. Our universities and academic institutions must take the lead to meet the moral challenge of our times and ensure that our civilizational values of love for motherland; performance of duty; compassion for all; tolerance for pluralism; respect for women and elderly; truth and honesty in life; discipline and self-restraint in conduct, and responsibility in action are fully entrenched in the young minds. Our Constitution has laid down that we have to build our society based on the freedom of human spirit, economic opportunities for all and social justice. Our economic growth will rely increasingly on the knowledge economy. Thus, a sound higher education system in our country is an imperative. The higher education system in India rests on the three pillars of quality, affordability and accessibility. At the end of the Eleventh Five Year Plan period, there were a total of 659 degree awarding institutions and over 33,000 colleges. During the Eleventh Five Year Plan period, 65 new Central Institutions, including 21 Central Universities, were established. Except for one state, there is at least one Central University in every state of the country. Despite this, the problems of quantity and quality persist. We are deficient in the number of quality academic institutions, on account of which, many bright students go abroad for higher studies. There are more than 2 lakh Indian students studying abroad, including US and UK. We should be able to draw our students to seek higher education in their own country. As per an international survey, there is not a single Indian university amongst the top 200 universities in the world. There was a time when we had world class universities like Nalanda and Takshashila which attracted scholars from all over the world. We can revive our lost glory. We have the capability to take at least a few of our academic institutions into the global top league. But for that, we have to change the way education is imparted in our higher educational institutions. A culture of excellence should be embedded in our thought process. Every university should identify one department that can be developed into a Centre of Excellence. I call upon the Central universities to take the lead in this transformation. To effect innovative changes to strengthen the higher education sector, a conference of the Vice Chancellors of Central Universities was organized in the Rashtrapati Bhavan in February this year. The conclusions arrived at the Conference on the measures required for effecting changes in the education system are being worked upon by the Ministry of Human Resource Development. I hope that we will achieve substantial progress in a short span of time. Despite India’s higher education system being the second largest in the world, the enrolment rate for the 18-24 years age group in India is only 7 per cent. Compared to this, it is 21 per cent in Germany and 34 per cent in the US. This effectively denies many good students the opportunity to acquire higher education. We have to increase accessibility in higher education as a means to achieve greater inclusion. Innovative teaching methodologies should be adopted by our universities by increasing the use of technology. The infrastructure of the National Mission on Education through Information and Communication Technology has great potential to facilitate collaborative information sharing. Transmission of important lectures to students studying in institutions situated far off from the urban centres is possible now. The success of inclusion in higher education also depends on affordability. Meritorious students from difficult socio-economic background should be assisted to pursue higher education by measures like scholarships, student loans and self-help schemes. Shortage of faculty has hampered our efforts at improving the standards of education. In Central Universities, vacancy is about 38 per cent. Immediate steps should be taken to fill up the vacancies. To tide over this crisis, we must also resort to technology solutions such as e-classrooms. Our teachers must possess the latest information and knowledge so that they can give their students the best education. The refresher programmes organized by the Academic Staff Colleges should be reviewed more frequently to retain their relevance to contemporary teaching. Socrates had said and I quote: "Education is the kindling of a flame, not the filling of a vessel” (unquote). We need inspired teachers who can shape the thoughts of the young minds. By their courage of conviction, deep knowledge of the subject, and extraordinary communication ability, an inspired teacher can not only assist the students in understanding and appreciating a subject from a wider perspective but also encourage them to question their own knowledge. Our economic progress will depend on our ability to innovate. India lags behind some of the major economies in innovation. Though Indians comprise one-sixth of the world population, only one in 50 patent applications in the world are filed in India. We have abundant manpower whose capacity should be developed by a sustained programme of education and training. But more importantly, we should revamp the systems to encourage and generate innovation. Our academic environment must be conducive for promotion of research. Increasing the number of research fellowships, supporting inter-disciplinary and inter-university research partnerships and establishing industry incubation parks would help in this direction. Our system must be suited to attract Indian scientists and technologists working abroad to return and work on short-term assignments. This decade is the decade of innovation. It should benefit the common man. There are grass root innovations that require technical and commercial assistance for converting them into economically viable products. Our Universities and Industry should mentor such initiatives. In the Conference of Vice Chancellors of Central Universities held this year, a recommendation was made to set up Innovators Clubs in the Central Universities to facilitate interaction between the teaching and student communities and grassroots innovators. Recently, I had the opportunity to open such clubs at the Babasaheb Bhimrao Ambedkar University, Lucknow and Assam University, Silchar. I was happy to see the innovations that have been made by the young people. I am sure this initiative will soon reach all the other Central Universities. I congratulate all the students who are getting their degrees today. Please remember that learning is a never ending process. At every stage of life, there will be opportunities to learn. Keep an open mind and equip yourself to face the challenges of life with poise, sincerity and courage. My best wishes for a successful life ahead.